The five Penthouses and ten Sub-Penthouses occupy the top eleven occupiable floors in Seascape. There are two Sub-Penthouses per floor while the Penthouses each cover an entire floor except for the top Penthouse which is two storeys. These ultra-premium residences feature substantial open plan living, extensive enclosable balconies, grand entries, and multiple bedrooms and bathrooms. They have the highest quality materials, fittings and appliances, and a luxurious interior design that marks them as some of the most exclusive homes in the country. The kitchens are perfect for entertaining with large marble islands, gas hobs and double sinks, while the ensuites - which feature a freestanding bath and double vanity – are the ideal place to unwind at the end of the day. 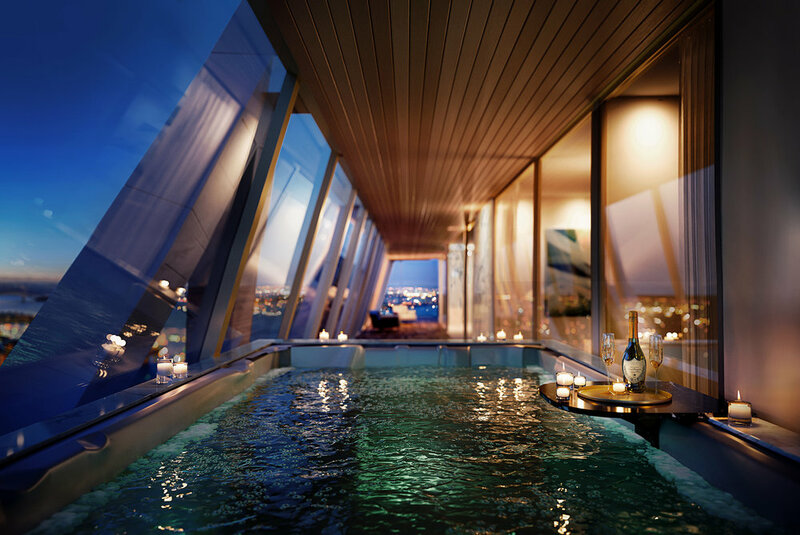 More than any other feature, it is the breath-taking panoramic views that make these residences so magnificent. Located over 130m high, with floor-to-ceiling glass and just one block back from the Waitemata Harbour, the penthouses have views that stretch from the CBD and Auckland Harbour Bridge, past the North Shore and Rangitoto, around to the eastern suburbs and Hobson Bay. It is a magnificent vista that no photo could ever do justice. The ensuite features a double vanity, double shower and freestanding bath with views to the harbour beyond.